These Victory Kingpin Hard saddlebags were originally designed for the Honda VTX. Art In Motion designed some custom brackets to adapt them to this motorcycle for a hard saddlebag option. They are mounted with new designed quick release brackets without relocating stock rear turn signals, you can easily remove them in just 2-3 seconds. The saddlebags have 40 Liters of Storage Capacity for each side. The inside is carpet lined which protect your valuable stuff from scratching and bouncing inside the hard saddlebags. Call (407) 847-0119 for information on this project, or fill in the form below. Options of finishing on the saddlebags are ready to paint (primer), gloss black (additional charge) or one tone color match (additional charge). 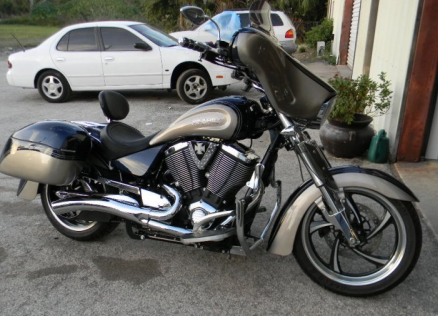 As shown, this motorcycle also includes a custom painted motorcycle fairing. The entire look enhances the Victory’s already sleek look. For the project shown in the photo, our customer provided an aftermarket fairing which we also painted to match the motorcycle with our motorcycle painting services. Delivery time is typically 6-8 weeks for the saddlebags if we don’t have them in stock when you order. There’s also the time to match your factory paint.